Joseph “Skoot” Mosby at a H.O.P.E. Inc. open mike at Dudley Cafe. Get high off my specific supply of knowledge/ naw, I didn’t make it through my first year of college/ I was too worried looking at too many white faces/ I was that black dot on that white piece of paper. 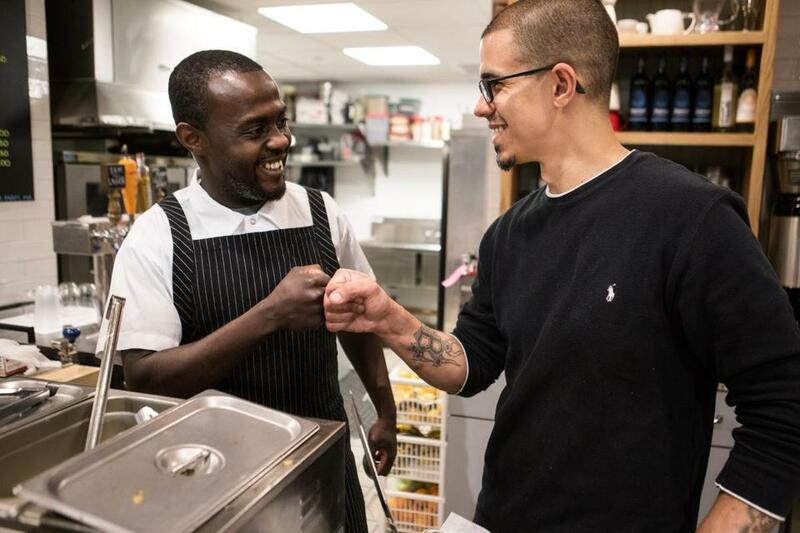 Behind the counter, Kwasi Kwaa is prepping food: spicy jerk beef on a Chinese steamed bun, luscious with pickled onion, cilantro, and jalapeno aioli, along with jollof rice, a starchy African staple. 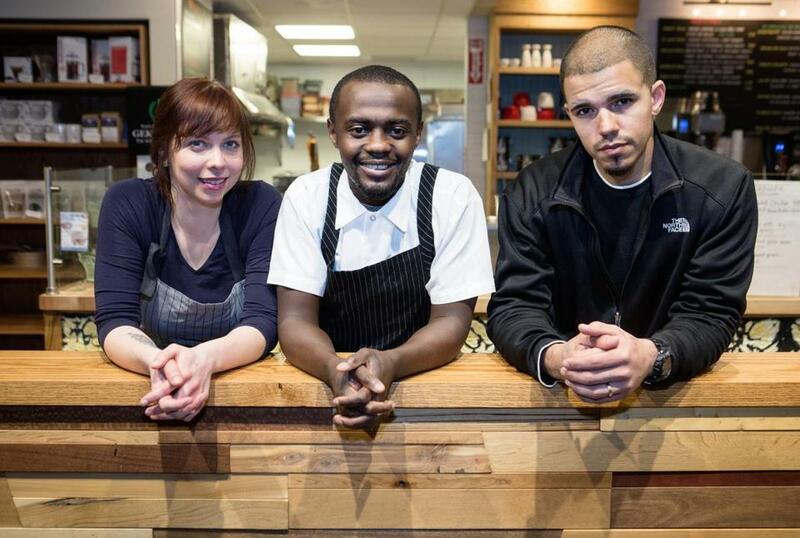 In Boston’s food scene, Kwaa, 29, is an up-and-comer, working as a sous chef at A&B Burgers in Beverly. He’s also the force behind this global street-food pop-up, Chop Bar, which takes its name and its inspiration from the tiny roadside restaurants of his Ghanaian childhood. Since November, Chop Bar has run in tandem with the H.O.P.E. Inc. poetry series here. It’s a venue for Kwaa and his collaborators to explore comfort food from around the world — the kind of food that draws people together, the food that makes community. Community like the circle of friends who started this open-mike series 10 years ago. Tonight, they’re also remembering the one friend who isn’t here. At the mike, the young man in the Timberlands finishes his poem and the house explodes, 70-something people cheering and clapping. Kwaa slides a steamed bun across the counter, dripping with aioli and hot enough to burn your tongue. Kwasi Kwaa (left) and Tim Ellis at the Chop Bar pop-up. Kwaa was born in Accra. When his parents immigrated to Somerville, he stayed behind with relatives. He grew up eating the spicy kebabs served at his professor uncle’s campus. Stews simmered all day on his aunt’s stove. The food landscape around him was rich, but narrow: Sit-down restaurants were rare; his introduction to Asian food came courtesy of a Korean student who cooked for him; pizza was a special luxury. It wasn’t until Kwaa was in high school that he realized he wasn’t in the US legally. As his American friends got summer jobs, no one would hire him: His papers weren’t in order. It was like a door slamming shut, he recalled. “It was terrible,” he said. “I hated not having money — not being able to just do regular things.” He felt as if he had no future. For a while, he floundered. But at 17, Kwaa found an administrator at Roxbury Community College who was willing to overlook his immigration status and enroll him. He scraped together tuition and became a college student. Their first party went off without a hitch. It raised their profile. 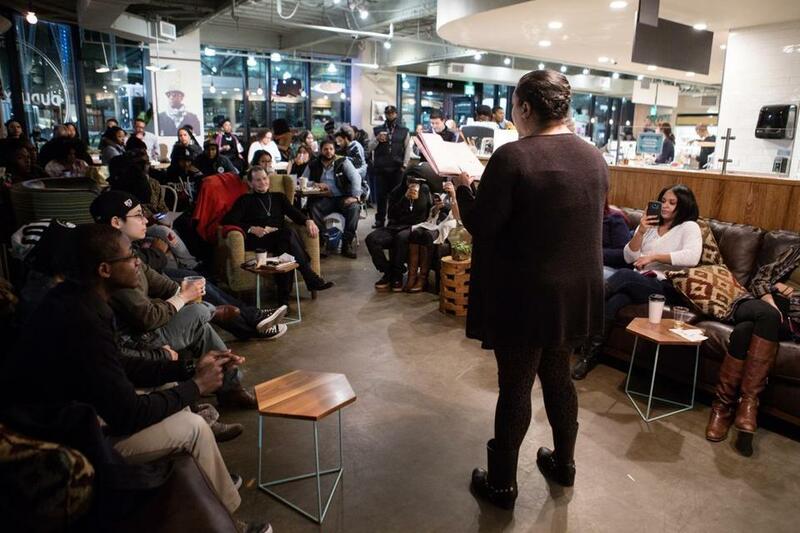 “All of a sudden,” Kwaa said, “girls knew about us.” One of those girls, Desiree Rivera-Decoo, had a suggestion: Along with parties, she said, they should organize poetry readings. Soon, Club H.O.P.E.’s poetry open mike became its signature event, with Rivera-Decoo and her friend Amanda Schaefer rallying poets and local MCs. “The whole thing became so dope, I couldn’t wrap my mind around it,” Kwaa said. Then, on July Fourth, the summer before his senior year, Kwaa got a phone call. There had been a fight at a cookout. Someone took out a gun. Wiggins had been shot. That job led to others: at Tatte Bakery and Cafe, then under executive chef Ethan Page, another mentor, at Fireside Catering. “All of a sudden, I’ve found something I need to focus my energy on,” he recalled. Food became Kwaa’s passion. He was rediscovering the tastes that fascinated him as a kid, both in Ghana and in Somerville. “It was definitely like a new sense of discovery,” he said. As he became more accomplished he began to dream of creating his own cuisine — something that retained the simplicity of Ghanaian street-front chop bars, but with an international bent. This fall, when a friend from Hi-Rise, Biplaw Rai, told him that he was helping to open a new cafe in Dudley Square, Kwaa saw his chance. “I’ve always felt street food is where the real good food is,” he said. He wanted a venue where people could sample that same connection between food and community. And he already knew that poetry could bring a community together. It was time to resurrect Club H.O.P.E. Sarah Trainer, Kwasi Kwaa (center), and Tim Ellis at Chop Bar. Kwaa got back in touch with Schaefer and her husband, Tim Ellis, another former RCC student who was also a chef. Together, along with a Hi-Rise colleague named Sarah Trainer, they dreamed up a menu, while Schaeffer and Rivera-Decoo put the call out for poets. Club H.O.P.E., now a nonprofit called H.O.P.E. 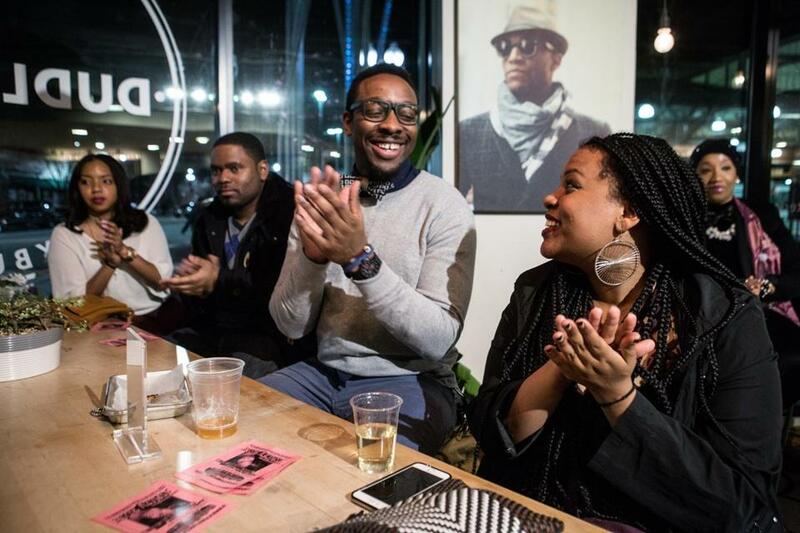 Inc., has poetry nights the first Wednesday of each month, in conjunction with its pop-up, Chop Bar. The food is “very experimental,” Kwaa said. 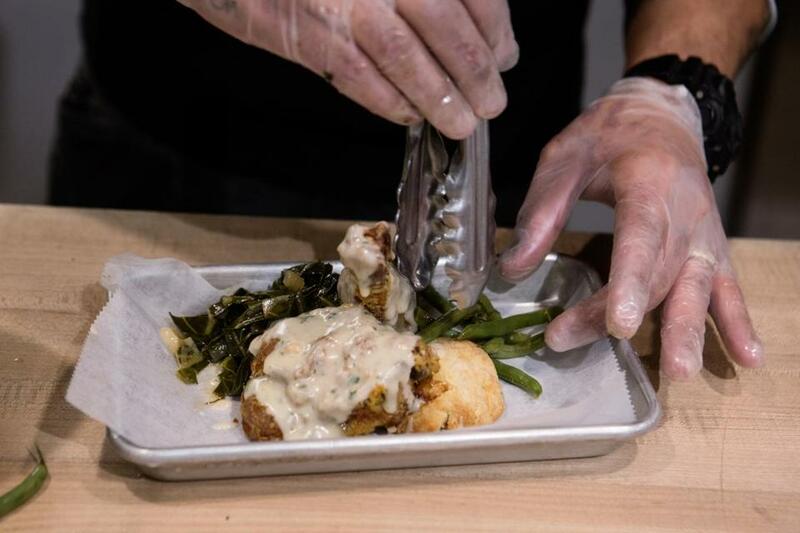 “We think about things we love and try to mash it up a little bit.” He started with jollof rice and goat kebabs, the food of his childhood, but a recent menu was brined chicken, biscuits, and gravy — Southern soul food — and he plans to explore Asian staples as well as street food from Liberia, Senegal, and Nigeria. 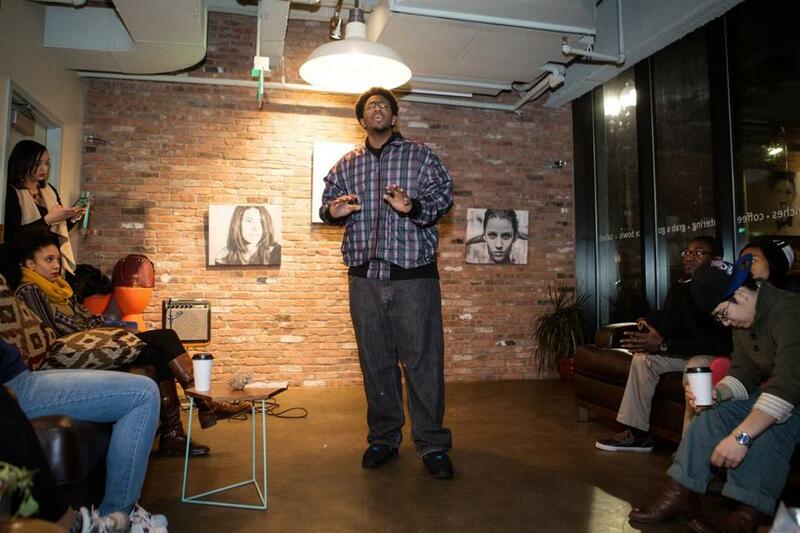 Resurrecting the poetry open mike brings him full circle, Kwaa said. He still stays off the mike, but now his food speaks for him. “We’re speaking without even having to speak,” Kwaa said. Tonight, though, is special. It’s Michael Wiggins’s birthday. As the evening ends, everyone — poets, audience members, Club H.O.P.E. founders, chefs — pours out into the rainy night. They’re holding purple balloons that whip in the wind. Kwaa looks up into the sky. He lets go of the string. Customers respond to a performer. Tim Ellis prepares brined and baked chicken. Jeannie Nunes at the H.O.P.E. Inc. open mike.